The DP9601 provides precise platinum resistance thermometer temperature measurement and logging for exacting applications in both laboratory and site locations. It is an exceptionally accurate and stable digital thermometer particularly suitable for use with thermal calibration baths as a reference standard. Applications include medical, pharmaceutical, food, environmental testing, R&D and educational establishments. Displayed values and user information are indicated on a bright clear LED screen with diffused backlighting. 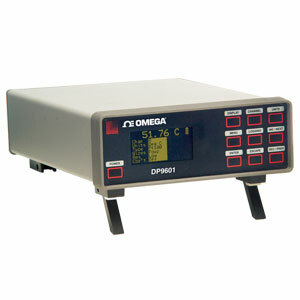 Data can be displayed in °C, °F, K, and ohms as required; nine front panel push keys, the only user controls, are used in conjunction with the display screen. It is this arrangement which makes for very simple and “friendly” operation. There are two input ports for 3- or 4-wire Pt100 sensors; the instrument automatically recognizes 3- or 4-wire configurations. The measured temperature can be displayed directly from one of the inputs or differentially between the two inputs. Differential temperature and the two individual channel temperatures are displayed simultaneously. A flash drive USB port is provided to allow data to be stored and/or exported. PC software running in Windows® is provided as standard; it allows programming of custom calibration, remote control and measure and logging functions. Supply: Internal lithium Ion rechargeable batteries; mains 90 to 260V 50/60 Hz universal adaptor included; battery charge life up to 12 hours with full charge. Application Note: Inputs are not isolated in the instrument, which is primarily designed for laboratory applications and site calibration of industrial temperature sensors. Probes connected to the instrumentmust therefore be isolated from high voltage pick-up. Precision PT100 RTD probe, -50 to 250ºC, 250 mm long, 6 mm dia. with 9-way D connector. Precision PT100 RTD probe, -50 to 450ºC, 350 mm long, 6 mm dia. with 9-way D connector. Nota: The DP9601 digital thermometer is supplied complete with PC software and user manual on CD (download also available), AC/DC power adaptor, USB comm's lead, 2 x 9 way D connectors for sensor inputs, mating connector for analogue output and quick start guide.